Robert Browning (7 May 1812 - 12 December 1889) was an English poet and playwright. He was born in Camberwell, London. He was married to the poet Elizabeth Barrett Browning. They both moved to Italy and lived in Florence. He had one son. Browning died in Venice, Italy. He was buried in Poets' Corner of Westminster Abbey. He wrote a poem called The Laboratory which was about a woman using poison to kill her lover's girlfriend. Browning's longest work was the poem The Ring and the Book. It consists of more than twenty thousand lines. It is based on a true story. It tells about a real crime committed in Italy at the end of 17th century. Its main hero is Pompilia Comparini, a young woman stabbed to death by her husband, count Guido Franceschini. Poet's best work is probably the book Men and Woman. It was published in 1855. It is a collection of monologues. Browning's last book is Asolando which was published in 1889. Gilbert Keith Chesterton wrote a book about Robert Browning; it was called Robert Browning and was published by Macmillan & Co. in 1903. 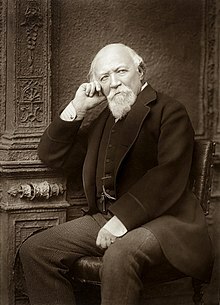 ↑ 2.0 2.1 2.2 "Robert Browning - British poet". Retrieved 1 October 2016. ↑ "Robert Browning - Biography". Retrieved 1 October 2016. This page was last changed on 12 September 2018, at 20:59.